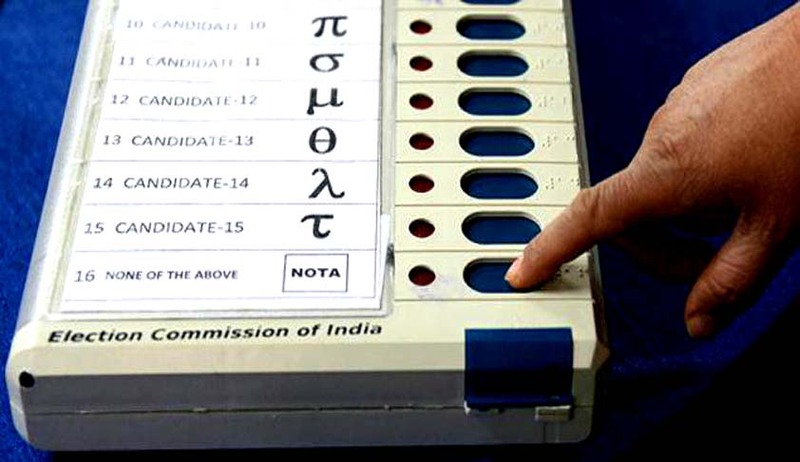 A Petition has been filed before the Supreme Court, demanding that the 'Right to reject' political parties be recognized and elections be declared invalid if maximum voters opt for the NOTA option. The Petition has been listed on 24 November, i.e. Friday in the Chief Justice's Court comprising Chief Justice Dipak Misra, Justice A.M. Khanwilkar and Justice D.Y. Chandrachud. Filed by Mr. Ashwini Kumar Upadhyay, the Petition submits that such a right is necessary to ensure free and fair elections, in line with Article 19 read with Article 324 (superintendence, direction and control of elections to be vested in an Election Commission) of the Constitution of India. It contends, "That political parties choose the contesting candidates in a undemocratic manner without consulting the electors that is why many a time people in the constituency are totally discontented with the candidates presented before them. This problem can be solved by holding a fresh election if maximum votes are polled in favor of NOTA." It further suggests that the rejected candidates as well as parties should not be allowed to contest again in the fresh elections so held and submitted, "The NOTA with right to reject and elect a new candidate will empower the people to express their discontent." The Petition relies on the 170th report submitted by the Law Commission of India, which had endorsed such right. The report had also suggested that contesting candidates be declared elected only if they receive 50%+1 of all the valid votes cast. The Right, it avers, was also endorsed by the Election Commission of India (ECI) in the electoral reforms proposed by it in 2001 and 2004. A similar view was supported by a 'Background Paper on Electoral Reforms', prepared by the Core-Committee on Electoral Reforms, Ministry of Law in 2010. The paper has proposed that if certain percentage of the votes are negative, the election result should be nullified and fresh elections should be held. The Petition highlights the fact that several candidates with criminal antecedents contest elections. It then submits that recognizing the right would help in keeping a check on corruption, criminalization, casteism and communalism as political parties would be compelled to give tickets only to deserving candidates. "The right to reject the candidates and elect a new candidate will empower the people and accelerate their participation since they could abstain and register their discontent with low quality candidates and political parties without fear of reprisal. It would foster purity of election process by eventually compelling the parties to field better candidates thus improve the current situation," it further submits. Thereafter, in addition to the recognition of the right to reject, the Petition also prays for cancellation of illegal, forged or fabricated Elector Identity Cards and also directs action to be taken against those who make such cards. Besides, a direction has been sought for the Government to consider feasibility of the reports submitted by the LCI and the ECI in this regard.